Part of my Dancing in the Craft Room plan was to convert my computer cabinet to becoming a hard to recognize craft cabinet. 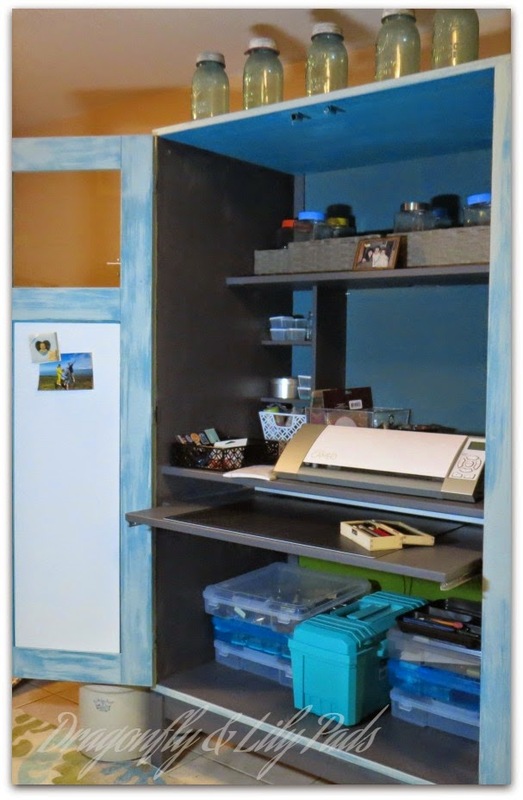 I am thrilled to have +DecoArt sponsor the plan to take a pine +IKEA USA computer cabinet that we no longer used into a craft cabinet. This was my first time and they said yes! I will include a list of supplies I purchased and sponsored provided at the end of the post. The Before picture of the Ikea computer cabinet with the rug purchased at +Tuesday Morning is the color inspiration for Dancing In The Craft Room II. The first coat already looks beautiful. I could have stopped here. I love the color named Treasure. This cabinet has to compliment our family room colors. I need to tone it down to better suit the area. Look closely through the next few posts to see where I kept that bright color I love in the cabinet. 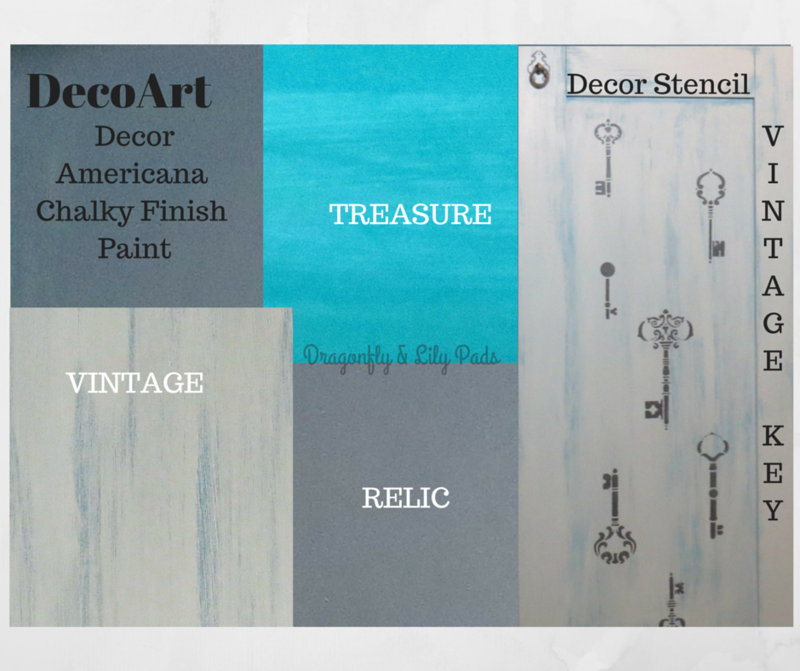 This represents my story board of paint color and stencil from DecoArt. This is going to be a great spot to work with my Silhouette Cameo. I love how my plan is coming together. 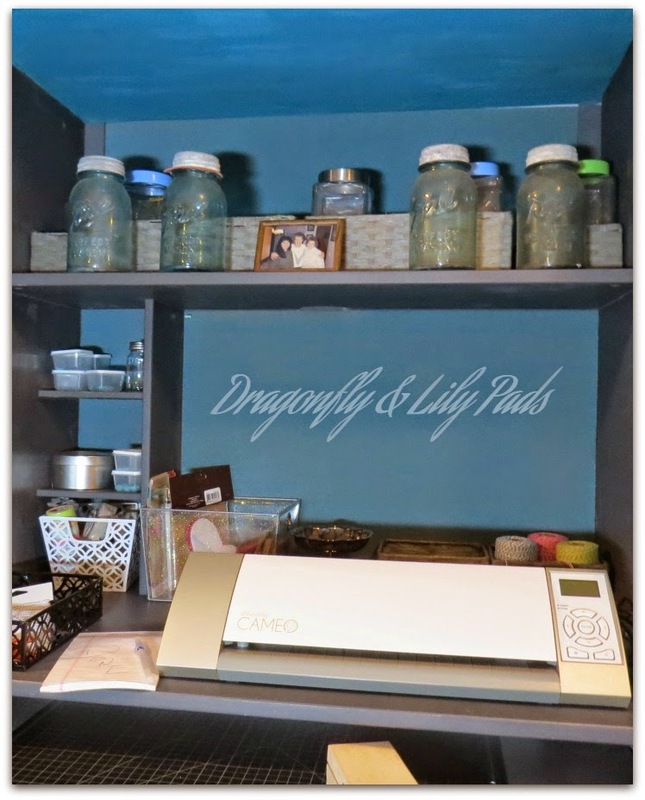 #AHeapOfChangeChallenge has been a great inspiration for me to make my craft room functional as well as pretty. The Back of the cabinet is cork board with the Relic paint wood trim to give the edges a flawless finish. As you can see she is painted relic on the inside with wax on the walls. The desk, and shelf surfaces are finished with varnish to make them more durable. 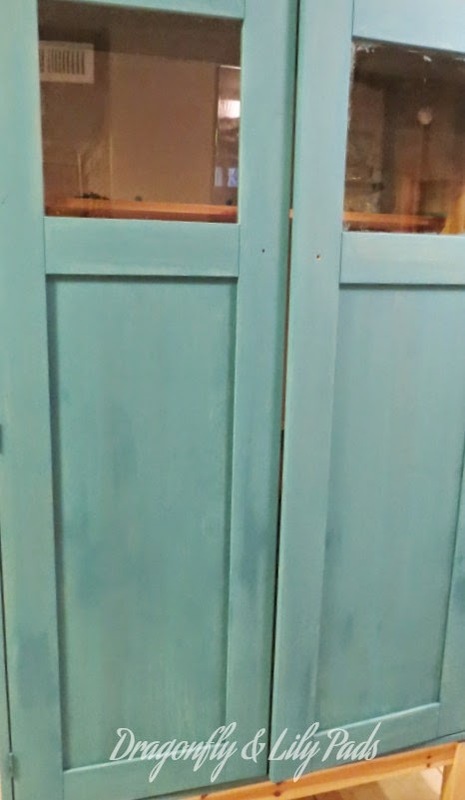 The color Vintage is brushed over all the outside and inside the doors but the not the base. I added one dry brush coat and decided to add more. After the second application I loved the effect of the two colors peeking out from each other. No sanding for this beauty since the effect turned out just as I wanted. 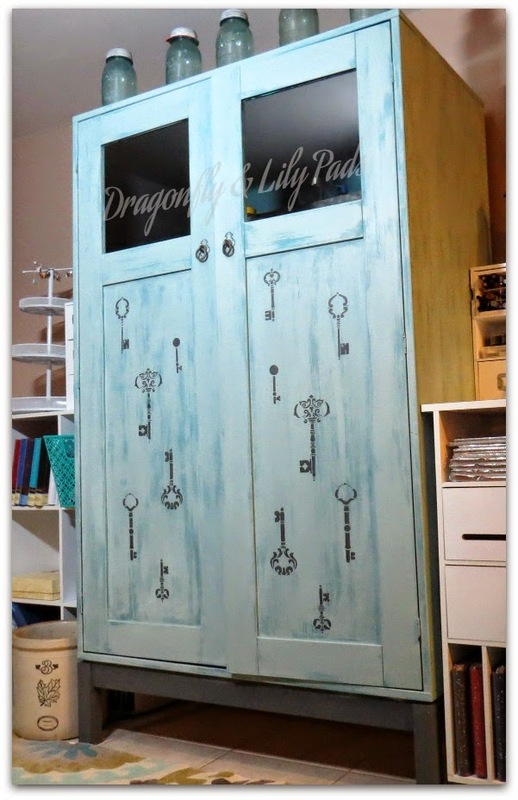 I added the Vintage Key Stencils do the two doors painted using Relic and a very dry stencil brush. I painted the base Relic for a little weight at the bottom, plus I think it ties the color story together nicely. Two coats of creme wax, buffing in between and I have a beautiful place to work in my craft room. Before this was an unused piece of furniture. After it is a useful surface with storage to create a efficient and beautiful work space. You know what that means I am Dancing in My Craft room while making #AHeapOFChangeChallenge progress everyday. Are you wondering why I did not use dragonflies? I chose the key for my adventures in my craft room and blogging as in the, Key To Success! I love when you throw a party. For What it's Worth is a great party. Thanks for stopping over and leaving your kind comments. Such a great idea! And we love the skeleton keys you added :) Thanks for sharing the transformation with us and linking up! Get out of town!! 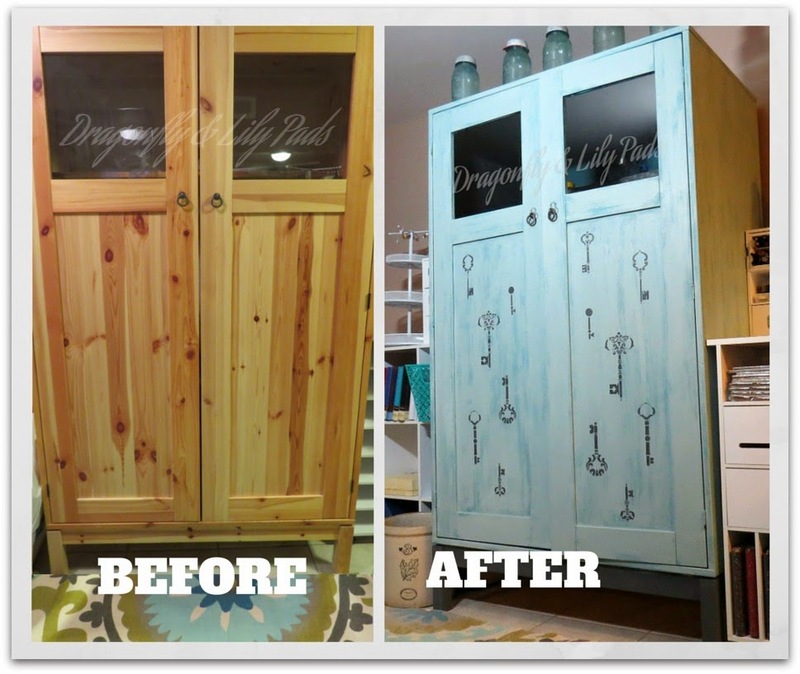 Your cabinet transformation is amazing!! Don't even get us started on the skeleton key embellishment! Great job! Thanks so much for linking up with Something To Talk About!!! Thank you so much for the lovely note. I hope you will back soon. Thanks so much for your sweet comments I am thrilled with the results. I am glad you came by and you should you come back soon. You flatter me thank you. Please come back to visit soon! That sounds like fun. be careful what you wish for I may just take you up on a Pool Painting Party! Thank you for your sweet words. Thanks for sharing at Something To Talk About link party! I love the paint color, this is gorgeous!! 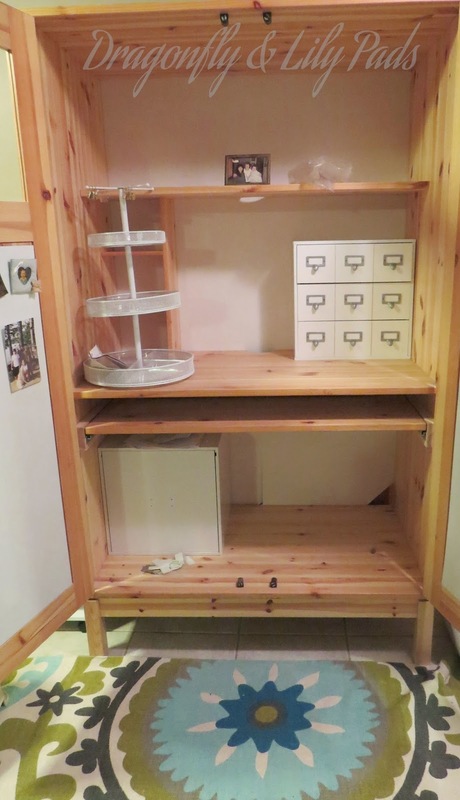 I need to get to IKEA, love this cabinet! Thanks so much for linking up at the Be~YOU~tiful Link Party!! Featuring your craft cabinet today! What a perfect place for work and inspiration! Love it!